What many women I meet don’t do, however, is use cloth wipes. For my husband and I, it seemed counterproductive to build our cloth diaper stash only to still use chemical-laden, disposable wipes. We have used cloth wipes, lovingly made by my mom, since our son was a newborn. My mom recently made some more wipes for our second baby who will be arriving in a month or so. The process is simple, even for those who have no sewing talent. I definitely am not a crafty, sewing type and I was able to make these wipes the first time around with minimal help from my mom! Cut your material into rough squares. Remember, these are going to be used to wipe dirty bottoms. Don’t worry about measuring! Take two squares of material at a time and put them insides together. Sew the two pieces together, taking care to leave enough room around the edge to trim the rough edges. Cut the raw edges around the newly sewn seam. You can either cut the whole edge off or you can fringe it. I prefer wipes without the fringe, so that is what we did with mine. The photo shows what the fringe option would look like. 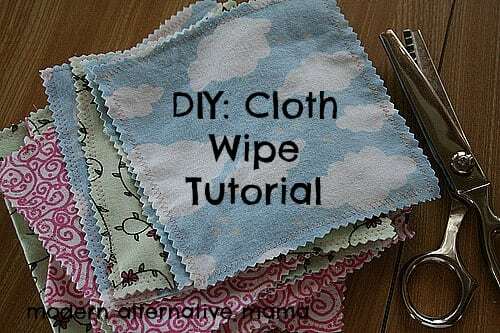 You can read this post from Modern Alternative Health for more information about cloth wipes and a recipe for wipe solution. Around our house, we just use water, but the wipe solution shared over there look pretty easy if you want something more than water. If you are new to cloth diapering and are looking for a one-stop resource to answer all your questions, check out Erin from The Humbled Homemaker‘s new book, Confessions of a Cloth Diaper Convert, for more info! Do you use cloth wipes for your babies? Ever thought about making your own? Like you said, they are going to wipe dirty bottoms! I just cut flannel and then use it until they are old and icky and toss…I quit sewing mine awhile back- I just grab old thrift store receiving blankets for .69 and go to town! Yes, that is true! We keep sewing ours because I have found that they hold up better in the wash that way. But, either way, they don’t necessarily need to be pretty. I chuckle when I see cloth diaper shops selling wipes for $10 for a pack of four etc. So simple to make your own! Great idea! I have no kids yet–maybe in a few more years, but am already hoping and planning to follow a LOT if not all, of kate’s advice. I have a sewing machine and can do basics, but just cutting up flannel into pieces sounds a lot easier! Thanks for the idea Michelle! Sewing the wipes and adding fringe or fancy cuts would be a great idea for a baby shower though! Jessica, if you choose flannel you will need to sew somehow, or the fabric will fray/unravel and be ruined in just a few washes. Terry cloth or fleece won’t, though, so you could use those instead if you don’t want to sew. 🙂 I like the ones I’ve sewed that are two-layer better than the ones I didn’t sew, which are one layer. I’ve used the same wipes for four years now! No issues. I think I was thinking of felt, which is much different than flannel! I’m straight now, lol. My husband and I use cloth wipes in lieu of toilet paper and will be using them on our baby when baby comes. Because I’m super cheap (and maybe a bit lazy – I choose to think of it as being picky about where I put my efforts) I just took a bunch of old t-shirts and cut them into rough squares and that’s what we use. No sewing at all! Even easier is to use the zigzag stitch to sew both sides together. No trimming and no fraying! We use cloth diapers and wipes with our little man. I bought wipes when we started out because it somehow never occurred to me that I could make my own. I’ve been thinking it would be helpful to have a few more though, so I will probably go with the idea to chop up an old receiving blanket! So cool. I loved my eldest in cloth nappies and made some liners myself – just cut outs. They were so handy for wiping messes too. I know you said that there is no need for measuring, but what is the general size of these? 8″ by 8″ or 12″ by 12″ or something? Thanks!! Rose-try 8″ by 8″. That is what size I did and they work great! what do the fringe ones look like after washing? they don’t fray if you fringe cut them? Depends on what type of fabric you use. Cotton will definitely fray. Any sort of polyester/synthetic fabric won’t.